July 18, Athens, in the morning. Good morning, Athens. Good morning, Acropolis. Good morning, sea. What a beautiful sight from our balcony. The air is so lovely here — dry and crisp, getting ready to be hot. Last night’s dinner was special. Found a little restaurant on a residential street near our hotel and ordered a bunch of mezedes. The eggplant salad had lots of peppers and herbs in it — tasted fresh and light. The skordalia was brilliant, full of lemon like very light and garlicky mashed potatoes. I remember the first time I had it, on fried eggplant at a little restaurant in an alley in London called Kalamares, about 26 years ago. I think they made that version with bread — it was pastier (that sounds bad but it was fabulous. Just thicker, not potatoey.) The zucchini fritters were great. Must have been some cheese and egg in them but the dominant flavor was dill. And zucchini of course. The grape leaves were meat filled, in a thick, lemony sauce. The eggplant and cheese was hollowed out eggplant, filled with chopped sautéed eggplant and tomatoes, with salty goat feta. 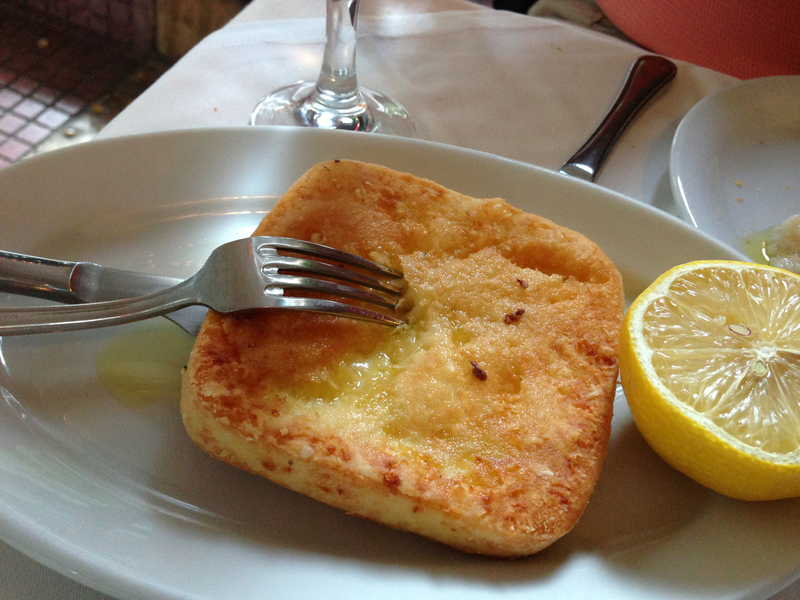 And the saganaki! Boy do I love fried cheese with all its salty lemoniness!! 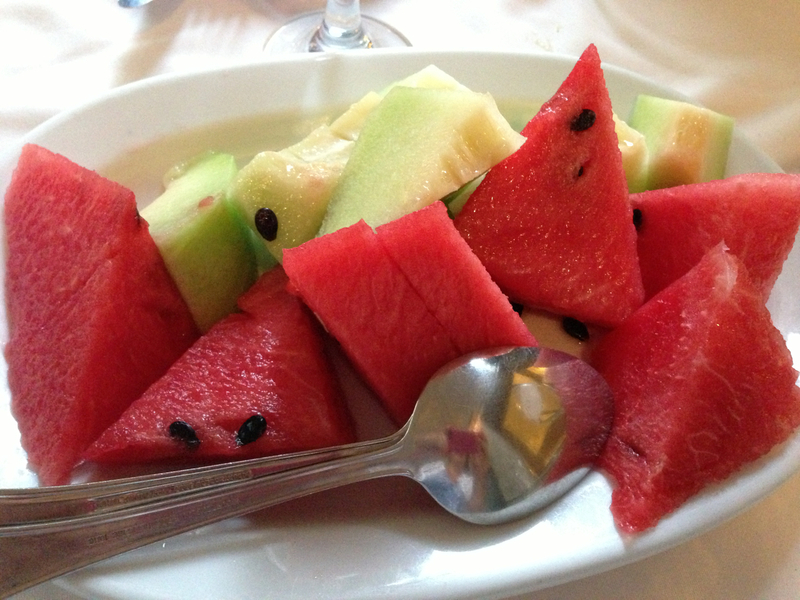 We were too stuffed to breathe but the waiter, impressed with the amount of food we put away, brought us a plate of fabuloysly sweet watermelon and honeydew. Really just a super treat. I am still full today but a breakfast buffet comes with our room and there is a Greek component so I will check it out. Meanwhile, I grabbed an iced tea from the minibar and I am enjoying the air and the church chimes and the view on the balcony. Feeling the presence of all the shades of Ancient Greece on that hill across the way. Post breakfast note — can I just say that the Greeks are WAY better at Greek yogurt than we are?